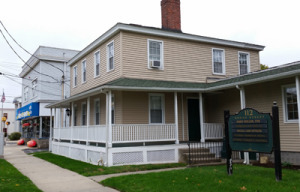 Schneider Law is located across from the Milford Town Green in a yellow double house with a sign in the front. Parking is available on the side of the building and in the back. The entrance to the office is on the side, in the alley, next to Tony’s Bikes & Sports. The entrance to the office is up a few steps and has a sign on the door saying Nicoll Law Firm, with whom the office shares space.